Completed in the summer of 1995, the 100,000 square-foot Fluor Daniel Engineering Innovation Building furthers Clemson's contributions to engineering education and to the economic development of South Carolina. The building is named for the Fluor Daniel construction company because its employees, many of whom are Clemson graduates, contributed over $3 million to the facility. More than 325 donors, including those at Fluor Daniel, contributed a total of over $4 million in private gifts and equipment. One of the main features of the building is the high bay area, a two-story, 6,000-square foot multipurpose facility. Equipped with an overhead crane to facilitate the operation of large research equipment, the high bay area includes the research operations of a wind tunnel, mechanical test frames, squeeze-casting of metal-ceramic materials, and fluidized beds and machining equipment. In addition to the high bay area, the lower level of the building houses a vibrations laboratory used to analyze the effects of structural vibration, and a rapid prototyping laboratory, which supports laser stereolithography equipment and other freeform fabrication facilities. This equipment can quickly create prototypes for newly designed or experimental parts for industrial use. The lower level is also home to thermal fluid systems laboratories, a project laboratory, and a research shop. 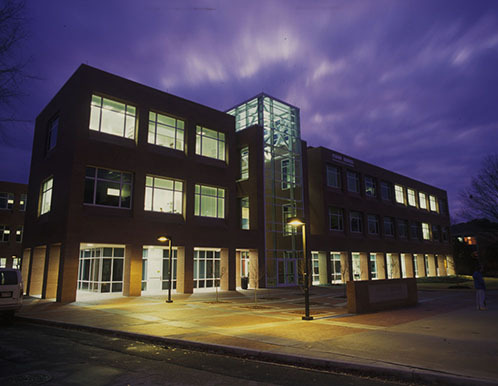 On the first level, several named rooms are located, including the Ben A. Leppard Conference Room, Willis H. Carrier Mechanical Engineering Administrative Offices, Georgia/Clemson University Alumni Undergraduate Student Lounge, Sigma Nu Fraternity Center for Advanced Manufacturing Offices, Bill and Carolyn Orders Lobby, Les McCraw Seminar Room and AT&T Electronic Devices Cooling Laboratory. Also included are thermal fluid systems laboratories, design laboratories, a metrology laboratory and a project laboratory. Other areas on the first floor include a graduate student lounge, multiple graduate student offices and a seminar room. Faculty offices for the Department of Mechanical Engineering are on the second floor. The mechanical engineering advanced computational research, RUST International Laboratory, is also housed on the second floor, along with an electrical and computer engineering locomotion laboratory and a boundary layer wind tunnel. Two laboratories for electrical and computer engineering, one for robot arms/industrial and the other for robot arms/redundant, are located on this floor, along with a robotics laboratory for mechanical engineering. Other rooms are a conference area, a faculty lounge, two conference rooms and two design laboratories. The third floor is ringed by faculty and graduate offices for the Department of Electrical and Computer Engineering. In addition to conference rooms and lounges, the third floor holds laboratories for image processing and speech analysis and a room for computer workstations. Other rooms include a ground plane laboratory, a computer laboratory and a power system protection laboratory. Also located on the third floor are laboratories for radar systems, spread spectrum, the Milton Holcombe Chair Advanced Communications Laboratory, real-time power systems control and a harmonic generation and testing laboratory. Four laboratory spaces recognize contributions made by companies: The Southern Bell Microwave Laboratory, The Barnes Telecommunications Laboratory -- Computer Network, The Georgia Power Company Power System Modeling Laboratory, and The Union Camp Power Electronics/Variable Frequency Drive Laboratory.